It hurts. It really, really hurts. We’ve only been on the trail for a little over three hours, but it’s been all up hill, and I’m beginning to feel the difference between trekking at 3,500 metres and trekking closer to sea level. 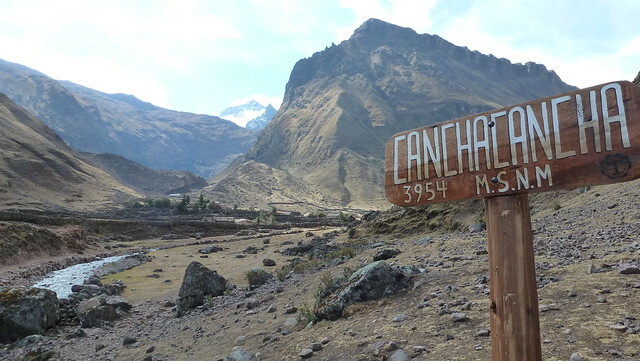 The trekking guidebook had described this trail north from Hauran to Cancha Cancha as a “gently sloping” four hour trek. The author forgot to mention the “very steep” middle part of the trail, the part where I am at the moment, taking deep breaths to try to recover a little. Seems Scott, the American I’m trekking with, is finding it a little harder. My impression is that I’ struggling a little with the altitude. In which case Scott is struggling a lot. Step by slow step I move, but within 200 metres he is 75 metres behind me. Anyway, press on we must, and reach out campsite by dark. But we finally got to the top of the ridge and there was the village! This is supposedly a very traditional Quechuan village, no roads leading here only walking tracks, where the people are living much as they have for hundreds of years. Traditional stone walls? Check. Thatched roofing? Check. Llamas grazing in the fields? Check. But then I spy a solar panel. And another. And a few plastic bottles and tin cans laying about. Damn, looks like the modern world is slowly encroaching even this remote corner of Peru. We check the time. Almost 3pm. Damn, that’s two hours later than we hoped to be here. We planned to get over the pass just outside the village tonight, to camp in the next valley, but that’s a two or more likely three hour climb, which would mean darkness landing before setting up camp. Not good. The above was all I wrote while on the Lares Trek, as it was an extremely exhausting trek, and after the first day of sunshine the next two days were cloudy and raining. We also got lost the next day while crossing into the next valley, and didn’t find a campsite until late the next night, supposedly the campsite we had been aiming for the first night. Due to this and the weather we cut short our trek without reaching Lares. However as you can see from the photos below, it was still an amazing place to visit. One day I’ll get back and complete the entire route.